For 2010, the Ford Fusion receives some exterior revisions, most notably on the front end, a higher quality interior, and more powerful engines. The previous V6 remains but now produces 240 hp, the old 2.3L inline-4 is replaced by a 2.5L unit, and a new 3.5L V6 powers Sport models. 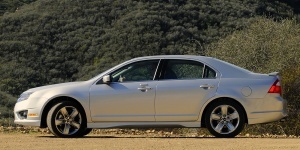 A new Hybrid version joins the lineup with excellent fuel economy.